Acrylic and water soluble, elastomeric waterproofing product for roofs that is solvent free. It creates a uniform, impervious to water, membrane, without seams. It is distinguished for its high adhesive strength and its long term resistance to adverse weather conditions. It maintains its flexibility at temperatures ranging from -20°C to +80°C, without bursting or peeling. Apply it easily on terraces, corners and edges, lead lined roof valleys, parapet walls and light wells, as well as roofs to be lined with clay roof tiles etc. The product is also suitable for recoating and maintaining existing acrylic elastomeric waterproofers. It is also suitable for spot repairs and crack sealing as well. 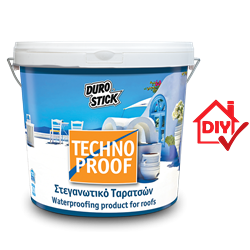 This product is an affordable, but also a reliable waterproofing solution. Classified as product for surface protection of concrete surfaces per EN 1504-2. 1.0-1.5kg/m² for two coats, depending on the substrate.